Buddleia – Butterfly Bush – Summer Lilac – an Easy Going Beginners Perennial Shrub. Buddleia – butterfly bush – Royal Red Buddleia Davidii variety in full bloom. Today I would like to tell you about growing buddleias, also called buddlejas, butterfly bush or summer lilac. 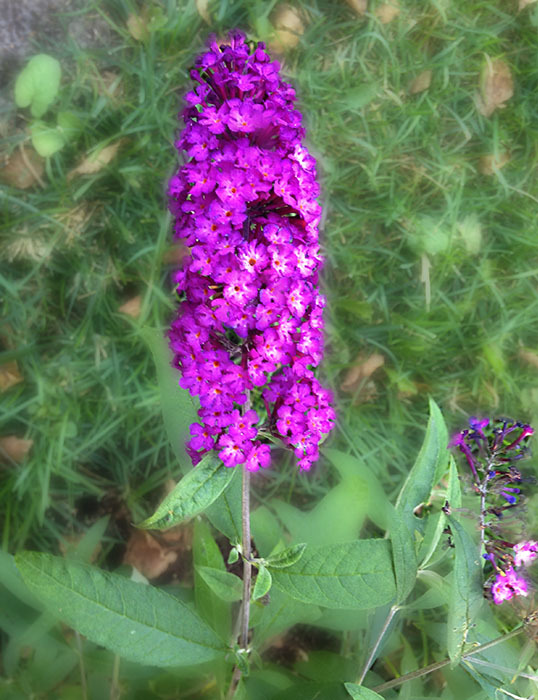 Presently I have two kinds of buddleia in my garden and both of them were planted during the summer of last year – 2015. I find them quite reliable and easy going, so I think these plants, as well as many other butterfly bush varieties, are quite suitable even for beginner gardeners. I have discovered buddleias thanks to my sister, who is also an avid gardener. She has mentioned to me that it is a very nice, flowering bush that attracts butterflies, bees, moths and occasionally hummingbirds. Living in a colder climate during a very harsh winter, she has lost her buddleia, but most likely will replace it with a new one. I started looking for buddleias (butterfly bushes) in local nurseries and sure enough, I have found one in the Lowe’s store. It was the last one and not in a great conditions, but at the store they said they might receive some more later. Eager to start growing it as soon as possible, I have purchased it anyway. 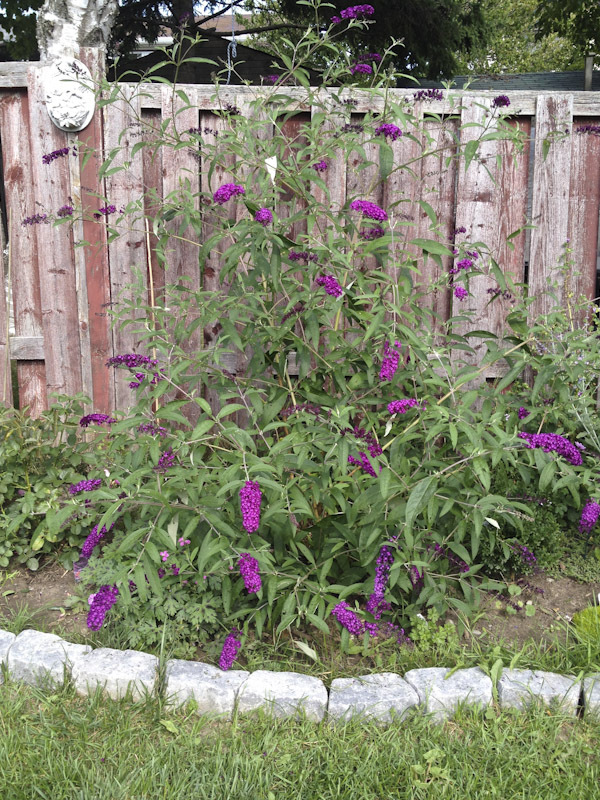 About my Royal Red Buddleia – Butterfly Bush. Close up of my Royal Red buddleia flower. The variety I have bought is called Royal Red Buddleia Davidii (at least such name was on the label), but it also looks very much like “Miss Ruby”, so perhaps it is the other variety (they look quite similar). It started growing quickly and soon enough it was blooming. 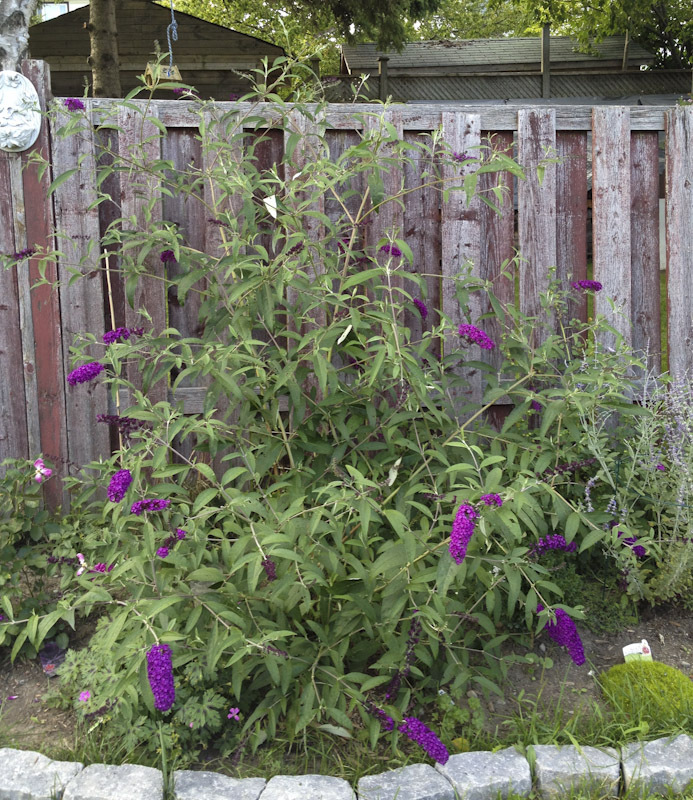 During one growing season my buddleia has grown a lot from around 1,5 foot to 4.5-5 feet. It had bloomed for me continuously last year and this year from around the middle of the summer (about the end of July) till the first frost. This variety has very nice dark pink or light purple flowers. They also have beautiful, sweet scent, which attracts butterflies, bees and other pollinating insects, as well as hummingbirds, which I have noticed beside my buddleia a few times this and last year. Later I have read that hummingbirds actually love purple flowers and their colour, as well as buddleia flowers’ sweet scent must be very attractive to them. How and Where to Plant Buddleias. My smaller buddleia. I am not sure what kind it is, but it stays compact and round. I have planted my buddleia in a sunny spot in my garden around the beginning of Summer 2015. Buddleias, to grow and flower well, need at least 6 hours of sun and fertile soils, which should be well drained, but moist. Since my soil is very heavy clay and buddleia likes lighter, well drained, but moist soil, I have added some peat moss, less heavy garden soils, as well as some sheep’s manure. As I have mentioned above, it started growing pretty fast after a few weeks of establishing itself and soon it was also blooming with beautiful dark pink-purple flowers. It seems that their flowing period is closely related to the temperature and being sensitive to cold, it stopped blooming right after the first frost (last year about October 15th). The same happened this year, but the first frost was about October 9th. Possible Problems with Growing Buddleia. My smaller, compact buddleia in August 2016 (in its second growing season in my garden). Buddleia’s blue-lavender flowers contrast very well with dark pink blooming Ebb Tide rose. 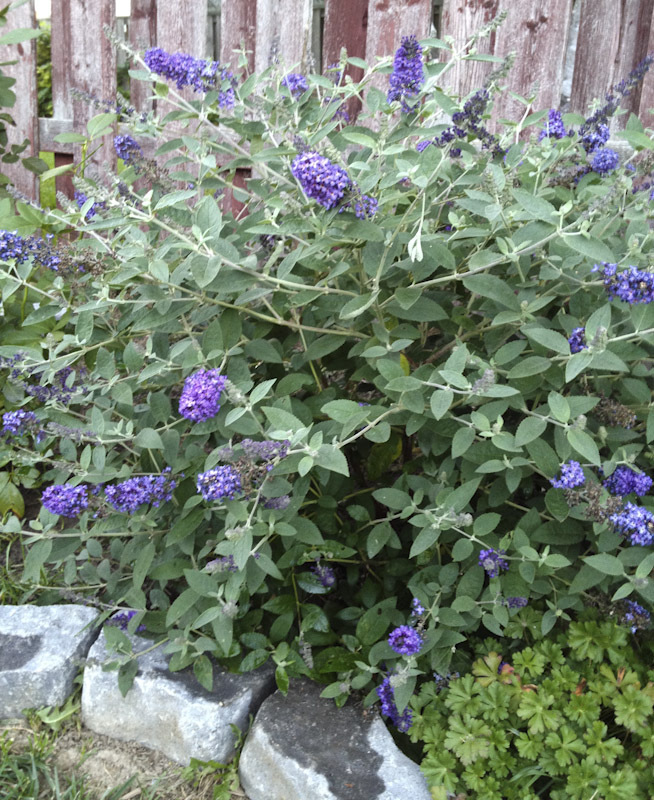 I have noticed butterfly bush it was quite sensitive to lack of water, particularly in the first year of growing, despite the fact that many sources say buddlaia is quite drought resistant. Once well established it seems to manage with a little less watering, but make sure you water it regularly, especially when there is very little rain. In the first season the only thing I had to watch out for while taking care of it, was watered it well, cut the spent flowers an occasionally a few branches, so it looked nice and tidy. 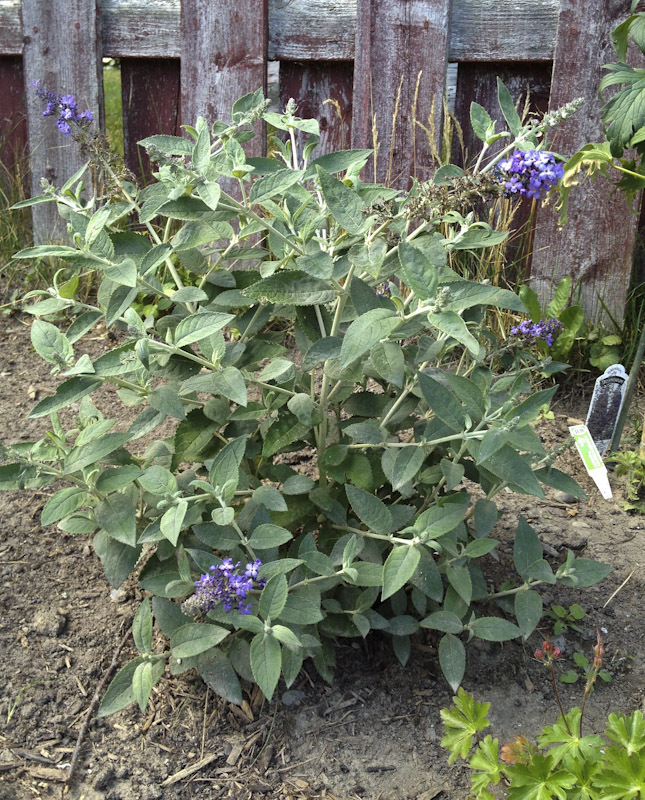 Butterfly bush also needs winter protection and I will discuss it in a moment. It didn’t have any insect problems then. This year, in the second growing season, starting around August, I noticed many big holes appearing in the leaves, but I couldn’t see any insects, which might be doing it. Finally I read somewhere, that earwigs might be to blame, but to find out if it is them, I need to go to the garden at night when they feed. So I did it and when I shined the flashlight on my Royal Red buddleia, in fact I have noticed many earwigs feeding on the leaves of this plant. To prevent that, I have used self-made insect trap under the bush and it help a bit. I have found several earwigs drowned in there over a few days. However the problem persisted almost till the end of the growing season, maybe because I was not really exchanging the traps often enough. I was busy with other work in the garden. Anyway, the problem with leaves was more cosmetic than really harming this plant since the bush continued to grow well and bloomed till frost. This season it has grown even bigger than last year to about 6 feet. I am attaching several pictures of this and my other buddleia to this post. Butterfly Bush Winter and Spring Care. My smaller buddleia around the end of July, 2016 at the beginning of its flowering period. It was extremely dry and hot July and it might have delayed the blooming of this beautiful flowering shrub. This year in the spring after the first growth appeared, following the advice I have found in books and on the Internet, I have cut my Royal Red buddleia to about 8-10″. It has grown back a lot during one season and it has flowered beautifully, as I have already mentioned. The sources I have found suggested it is best to cut the plant pretty much, once the first new growth appears in spring (more or less depending on the variety you have) to control sometimes too much, or chaotic growth and it helps buddleia to produce more flowers in the new season. It is so, because this flowering shrub makes new flowers on so called “new wood” (this year’s new growth), at the end of brunches. Cutting spent flowers (deadheading) stimulates new growth and more flowers. During the warm period of the the year, it buddleia also continuously makes new side branches with more flowers. The flowers are not too long lasting, but there is lots of them. I am not sure if you also need to cut so much mini buddleia varieties in the spring, but if they stay small, continue to bloom well and didn’t die back to the ground in the winter, it might be not necessary. In fact, the second buddleia I have also purchased last year, but around the beginning of August, is a more compact variety and it has very nice, smaller, blue-lavender flowers. I am not sure what is the name of the variety I have since I have lost the label. This shrub is much smaller and stays more compact and rounded in shape. Last year when I have bought it it was very small and has grown around 1 foot. It survived the winter very well, and since it was still pretty small and looked nice, I didn’t need to cut it back almost at all besides trimming few death branches damaged by frost. Now it is about 2 feet. Buddleias are sensitive to cold and in zone 5 could die back to the ground, but hopefully should come back in spring, since roots are considered hardy to zone 5. Mulching and other winter protection, could help them to survive the harsh winter, especially when not well established. It is also not recommended to plant buddleias close to the winter. Give them some time to establish themselves before cold season. If you live in warmer climate and your buddleia has grown a lot, or it is looking untidy and you want it to flower more, you might need to cut it back as needed to keep it more compact (usually it should be done in the spring when you see some new leaves). Pruning in the fall is not recommended, but I have cut mine a bit this year to about 1.5 m to make it easier to protect in winter. 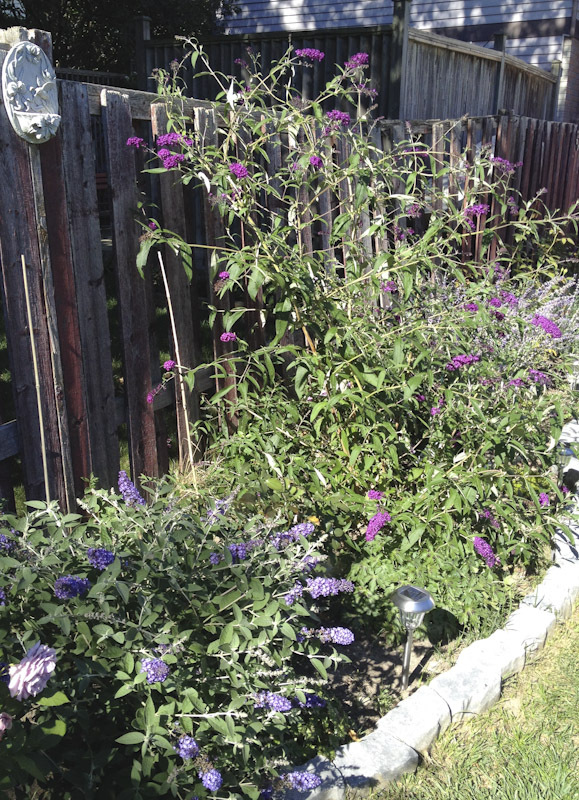 Here you can see both of my buddleias – compact on the far left and Royal Red buddleia in the center. Between them there is Ebb Tide rose and some flowering geraniums. 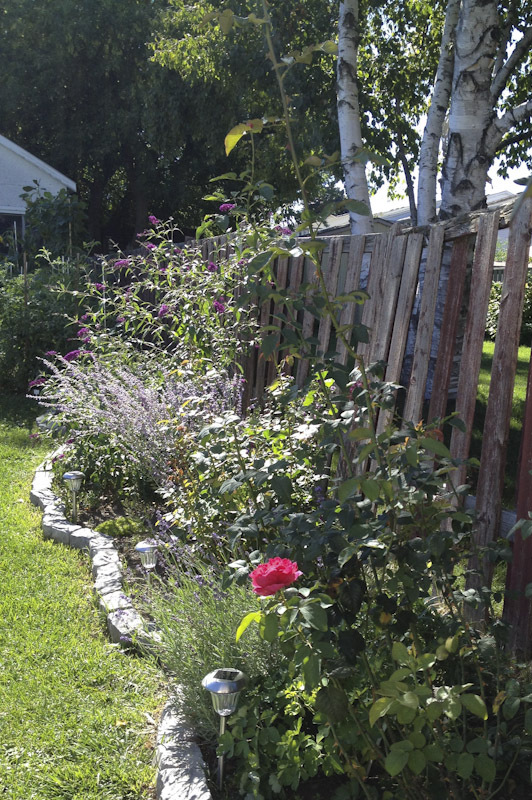 Russian Sage is visible on the right. This picture was taken around the end of August 2016. In the late fall, I have treated my buddelias in a pretty similar to my roses. Last year I have added a few inches of cedar chips mulch on the top and around the root of both my buddleias. I have also wrapped them with burlap once the ground started to freeze (here around the end of November or the beginning of December). I will do the same this year. I have already added mulching and will add burlap once it will get colder. To help buddleias grow well, fertilize them in the early spring by giving then some good quality, fertilizer and then later about 2 more times. Specialized fertilizer for trees and shrubs is recommended, but I have just used regular fertilizer, which was designed for flowering plants. I have also given my buddleias a little bit of natural fertilizer made from worm castings with rock dust once during the year (I have used Worm Gold Plus from TT Seeds). All together, I have fertilized them 2-3 times during the growing season up to around the end of August. Beautiful and quite compact Ebb Tide rose seems like a perfect companion for my purple and light blue buddleias. There are about 100 buddleia species and almost all of them are shrubs under 5 m (16 ft) tall, but there are a few, which can grow as trees up to 30 m (98 ft). They naturally grow in tropical and temperate climate areas and there, some of them are even evergreen, other decidous (seasonally loose leaves). Budleias growing in the wild are found from southern United States to Chile and mostly in southern-eastern parts of Asia and Africa, but not in Europe and Australia. Buddleias can grow from zone 5-9, but. as I have mentioned, in colder zones they usually need proper winter protection to survive, so they can not grow without gardener’s help. There are species , which can be invasive in certain areas. To prevent invasive butterfly bushes from spreading, in some regions of USA, only seedless varieties are allowed to be sold in garden centers. I don’t think we have to worry about buddleias spreading in our colder climate and if you worry about that, you can always select only seedless varieties. I already have my two buddleias for 2 growing seasons and I have never noticed them spreading in my garden. Recommended Buddleia Varieties, Including Dwarf, Patio or Small Garden Suitable Plants. 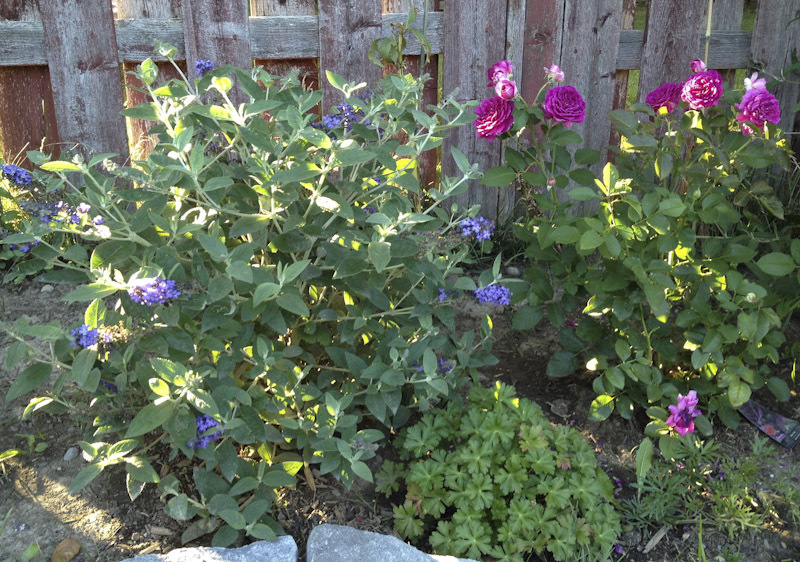 You can see here both of my buddleias – the blue compact and Royal Red in the back. This picture was taken around the middle of September, 2016. Most popular buddleia species for your garden include the one I have – Royal Red. Also Black Knight (very dark purple), Sungold (golden yellow), and Pink Delight (pretty light pink). Recently, due to heavy cross-breeding, many new beautiful and very compact, often seedless varieties were created, like for example Blue Chip , which reaches up to 2–3 ft (about 60-90 cm), and which is also sterile (no seeds). It is particularly important to cultivate such sterile, non-invasive plants in the USA where in some regions, very invasive Buddleia davidii and its cultivars are banned. Last year and this year I have found many buddleia varieties offered for sale in many garden centers from around the end of July. Much later in the season, whatever was left, sometimes was available for just a few dollars, so it is easy to get one for a very good price, at least in the Greater Toronto Area where I live. View on my garden around the middle of September 2016. You can see buddleia Royal Red in full bloom behind Russian Sage. On the Proven Winners Website you will find several compact and other varieties. At the moment, I see there 6 videos about compact Proven Winners buddleias and you will find other bigger varieties of buddleias they also recommend below videos. I have also found 4 more compact buddleias from the Pugster series listed in Proven Winners PDF here. To summarize, there are so many beautiful and various size buddleias to choose from, many of them also suitable for patio or small garden, and blooming in a variety of colours, so it should be pretty easy to find one you will really like. They are quite easy to grow and bloom for a very long time. Most buddleias should survive up to zone 5 with winter protection (at least their roots). These amazing shrubs will not only decorate your garden, but also provide a great food source for many butterflies, bees and other pollinating insects, as well as for hummingbirds, if you have them in your area. I really highly recommend them, even when you are just starting up as a gardener. I am curious to hear about your experiences with buddleias, how you grow them and which varieties you recommend. Below you can see bigger size pictures in my buddleias – butterfly bush gallery. 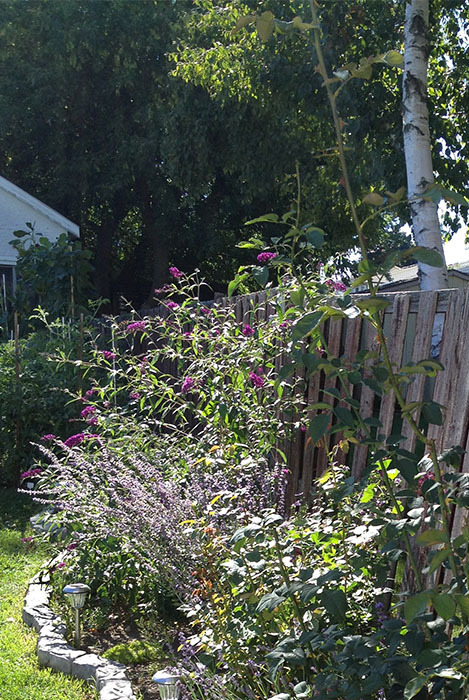 You can see here both my buddleias – the blue compact and Royal Red in the back. This picture was taken around the middle of September, 2016. 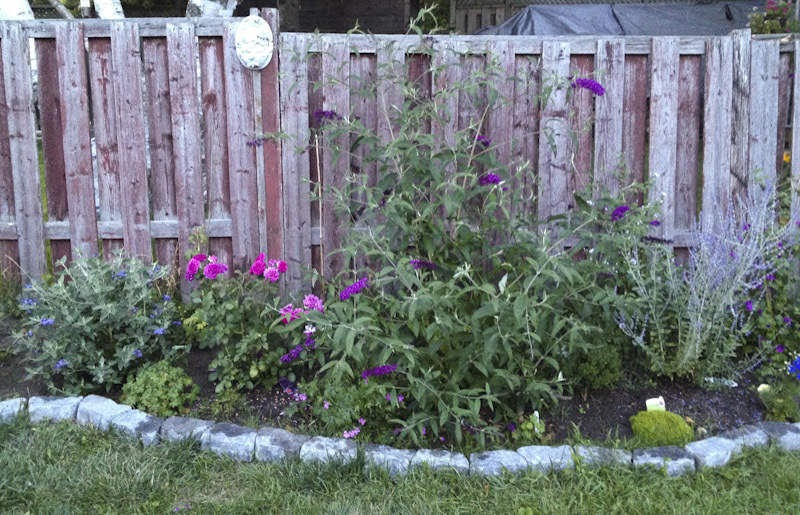 Here you can see my both buddleias – compact on the far left and Royal Red buddleia in the center. Between them there is Ebb Tide rose and some flowering geraniums. Russian Sage is visible on the right. This picture was taken around the end of August 2016. My smaller buddleia around the end of July, 2016 at the beginning of it’s flowering period. it was extremely dry and hot July and it might have delayed the blooming period. My smaller, compact buddleia in August 2016 (it’s second growing season there) beside blooming Ebb Tide rose. My smaller buddleia. I am not sure what kind it is, but stays compact and round. View on my garden in the around of the middle of September 2016. You can see buddleia Royal Red in full bloom in back, behind Rusian Sage blooming with lavender colour small flowers. Next Post My Autumn Joy – Little Blue Flower – Rocky Diamond – Blue Heart.